Hi! Welcome to A Sampling Bee! Today, I share with you a monthly subscription box called BooklyBox. This subscription box is perfect for book lovers. 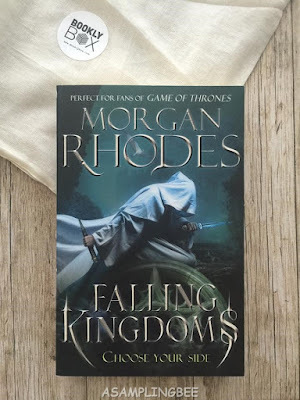 BooklyBox sends their subscribers a new book each month along with other fun goodies. BooklyBox offers their readers their choice of 9 different genres to choose from. Some of those genres include Fantasy, Mystery, Self-help, Children's and Young Adult. When you subscribe to BooklyBox, BooklyBox donates one book to kids/teenagers/adults in less developed countries. March's box included two tea satchets from Tazo Tea, a bookmark and a sticky note pad. 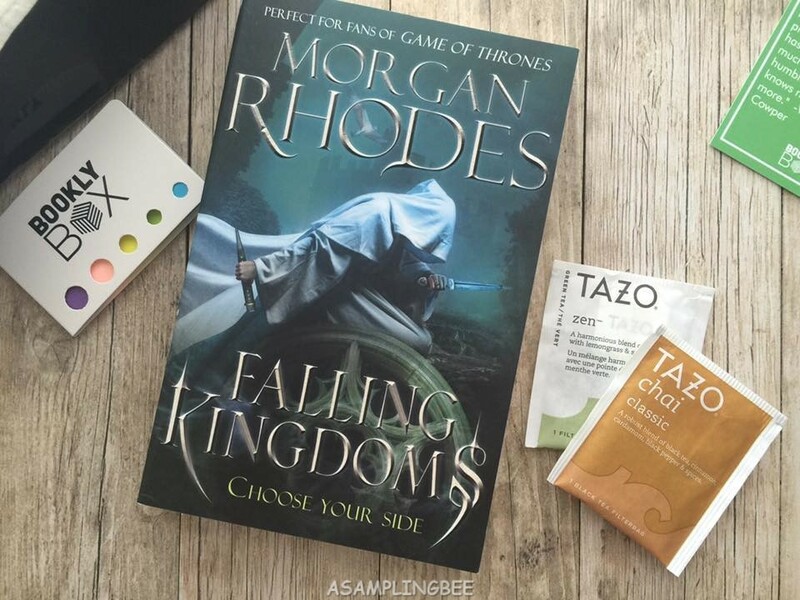 The book that was included in March's box was Falling Kingdoms- Choose Your Side written by Morgan Rhodes. This book is perfect for anyone who loves Game of Thrones. This is the perfect box for me because number one, I love to read. Number two, I LOVE tea. Especially Tazo Tea. There is nothing more relaxing than a good book and a hot cup of tea. BooklyBox makes that possible for me :) BooklyBox is fun for all ages! My husband is a book lover, so this would be perfect for him! Oh my gosh this is perfect for my mother in law! What happens if they have already read that book though, because she reads a lot? There is a monthly subscription box for BOOKS?? How did I miss this?? I need to check this out ASAP!! I love subscription boxes that caters to my interests and it's nice to have a new book each month! I'd love to read this book because I really enjoy Fantasy and Sci-Fi novels! This is such a cool service. I love that it comes with some nice goodies along with the book. This sounds like a great box for the book lover like me! Though I'm so particular about books, I'm not sure I'd like this one. This is amazing and perfect for book lovers. Love this idea. Can be helpful for authors too! I am so into reading and have a stack of books on my night stand. This looks like something I must have! My sister is a fan of that kind of genre! That sounds really great. Lots of great books for book lover to use. Perfect to share with friends. This is super neat! I love getting new books and more the surprise the better! How cool is that! I would love to pass this along to my book lover friends. Thanks for sharing. Sounds like a great book! So cool and nice cover. Thanks for sharing! 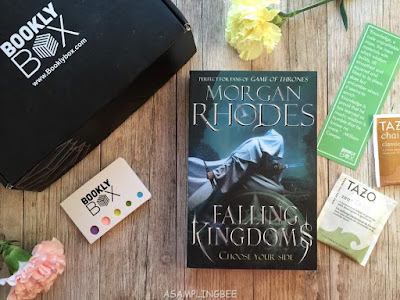 What a fun box for book lovers, I love the idea of subscription boxes!